Starting today PlayStation Plus members receive discounts on games like Shadow of the Colussus, Crash Bandicoot, and Spyro the Dragon. In an update to the PlayStation store today, Sony has added several discounts to fan favorite games, including a free download of Shadow of the Colossus for the PS3. You must be a PlayStation Plus member to take advantage of the discounts. Shadow of the Colossus came to the PS2 in 2005 - with an HD release for the PS3 years later. Armed with a sword and a bow, you aim to take down the colossi and resurrect a girl named Mono. Desaturated colors and darkness set up the atmosphere of a forbidden land for the hero's lonely journey. 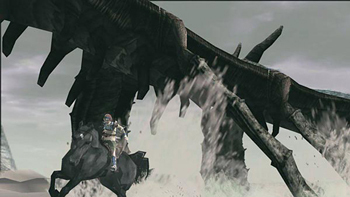 The game also has few enemy encounters, limiting it to 16 colossi, but each presents a unique challenge. Shadow of the Colossus is a part of the Instant Game Collection and will be joined by Hotline Miami and Kingdoms of Amalur. When asked about Hotline Miami, Kristine Steimer from the PlayStation blog hinted it would get its time in the collection later this month. There's also a sale on many Activision titles. Crash Bandicoot, Crash Bandicoot 2, and Crash Bandicoot 3: Warped are each $2.99, as are Spyro: Year of the Dragon, Spyro: The Dragon, and Spyro: Ripto's Rage! However, those discounts all end on Oct. 15, so mark it on a calendar. Also leaving on the 15th from the Instant Game Collection is Saints Row: The Third. If you're already a member and haven't checked out some of those games, it will be worth your time to try them out. Well I already own SotC, so I'm good there. I might have to consider getting Spyro 2 now that it's that cheap. Either that or Crash 3. To those who have Playstation Plus and have yet to play SotC, NOW'S your chance. You almost have no excuse not to try out this masterpiece of a game. GET IT NOW!!!11! Beaten to it already I see. If you can be patient with the less than perfect controls there is absolutely no good reason to avoid playing the game. Despite it's simple premise it is one of the most special games I have ever played, something about the aesthetic is captivating, and the designs of the colossus are fantastic. +1, hardly anything else I could add to that. Let's keep this SotC Praise Train going! Oh, and Kingdoms of Amalur is already up (snatched that already), and just waiting on Hotline Miami, now. Well I was planning to get PS+ when I got a PS4, but I have wanted to play SotC since I first saw it. Guess my PS3 gets to stop being a paper weight for a while. A guy a bit above me (My reply button is broken, has nothing to do with escapist) mentioned SotC has bad controls? Why do people think this? It has pretty damn good controls pretty much universally (well Arou handles awfully) and has an acceptable camera to boot. I will admit, the controls take some getting used to. Wander is certainly no Bayonetta in terms of smoothness and ease of control. Still though, I like to think it adds to the game. You're essentially playing as a regular guy taking on damn near impossible odds to bring your loved one back from the dead. As for Agro, a lot of people don't seem to realize you don't actually control Agro, all you do is steer her and make her go faster. She moves on her own, like a real horse. Sony has masterpieces like this on PS Plus, while in the 1 year Microsoft has Games for Gold, several of the Xbox 360 games made free are random RTS games few people care about. By the way, I got an email from Xbox Live Rewards for being on there for 1 year with a gift. Was it some cash in some way or another? No, it was a print-out "birthday cake". Microsoft, you are such trolls. I have one doubt about this things, In the PS+ system, when a game is "free" does that mean for ever? Or is it a temporary thing? Maybe I'll give it another try. I played this back when it was new and didn't find it that interesting. Replayed it when the collection was released (friend brought it over) and figured the rather wonky controls might be why I didn't find it interesting. Third times the charm, or so it's said.